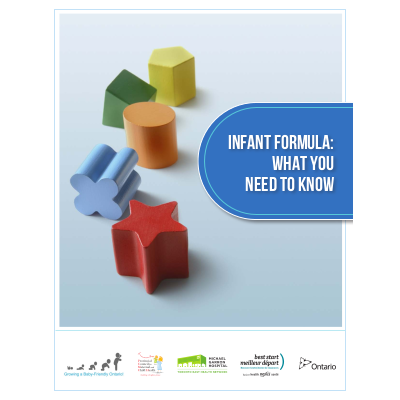 Developed by the BFI Strategy for Ontario, this booklet is designed for service providers to guide families with informed decision making regarding infant feeding. The booklet also provides information on safe preparation, storage and feeding of formula. As part of the Baby-Friendly Initiative, this resource is intended for individual discussion, and should not be on display nor given out in group situations. Also available in French, Arabic, Bengali, Chinese, Farsi, Gujarati, Hindi, Korean, Punjabi, Russian, Serbian, Somali, Spanish, Tagalog, Tamil, Urdu, and Vietnamese.